You know that commandment that says "Thou shalt not covet thy neighbor's house?" Well, I kind of broke it. And by broke I mean that I smashed it to little bits. You see, this weekend I visited my sister-in-law's house and oh my goodness is it ever beautiful (totally worth breaking a commandment for). In fact, one of these days I'm going to do a full-on John and Sherry style house crashing tour but today you'll just have to settle for a sneak peek of some of my favorite elements. Honestly, I would love to have one of my own. Unfortunately, I have a weird thing about chalk dust. (It's right up there with pumpkin guts in terms of giving me the heebie-jeebies which is a strange thing for a former teacher to admit....) I do have a similar idea in mind though, and if I ever execute it I'll let you all know. Again, she made a frame out of molding. She then proceeded to wallpaper the middle. 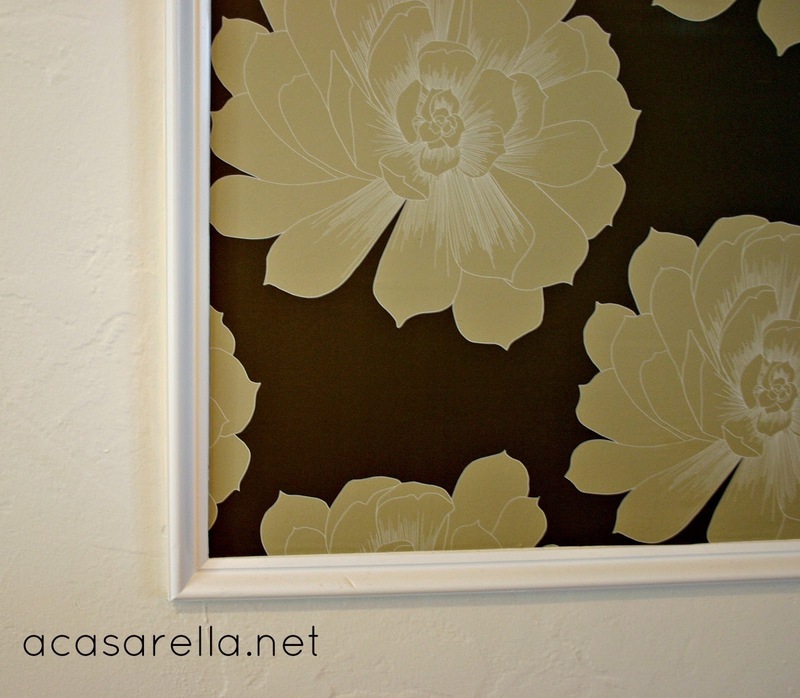 The project isn't exactly complete; there will eventually be a console table and a mirror resting against the wallpaper. I will definitely post a picture when the room is done. I just know it's going to be fabulous. It's only a tiny corner but this little built-in suggests just how charming and whimsical the whole room is. 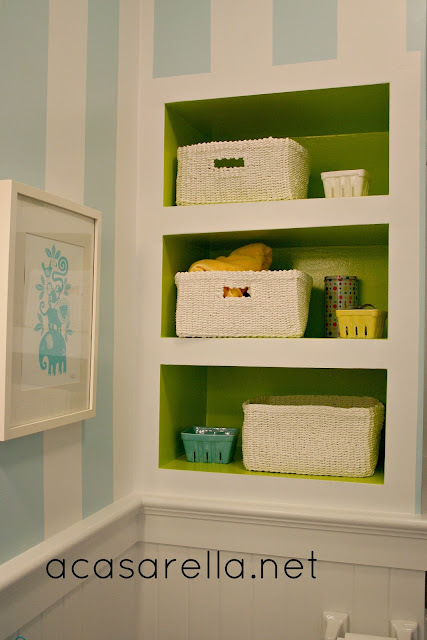 Don't you love the striped paint and the punchy green color inside the niche? I mean, who wouldn't want to be potty trained in there? 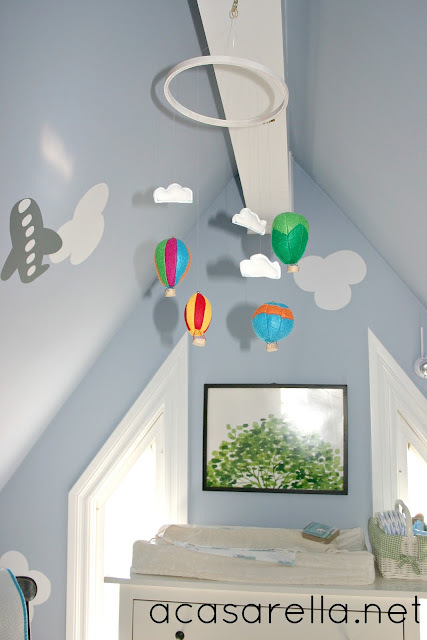 And if you're admiring the rest of the room, wondering about the pretty painting or the fun architecture, don't worry. I really do plan on doing a full house tour some day. Until then you'll just have to covet this tiny bit. 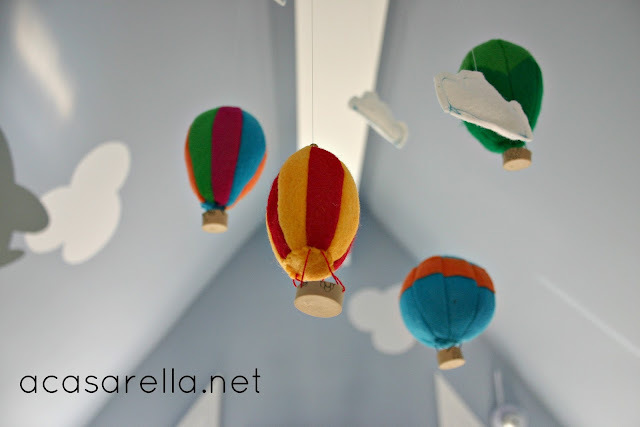 Your sister-in-law has a beautiful home and she is really creative! I cannot stop looking at that framed wall paper! 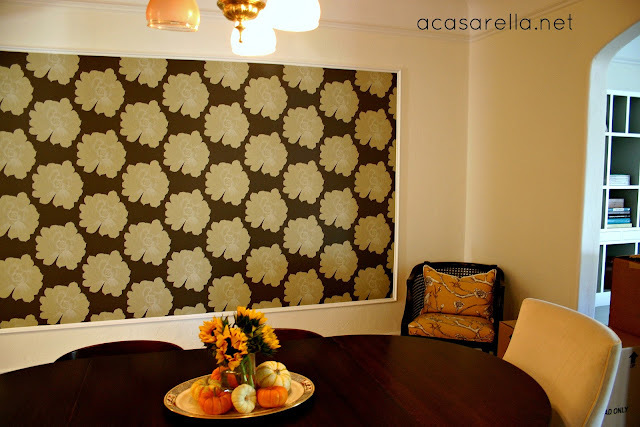 I love wall paper patterns, but refuse to put any in my house. (I've taken off way too much wall paper to ever put any up!) 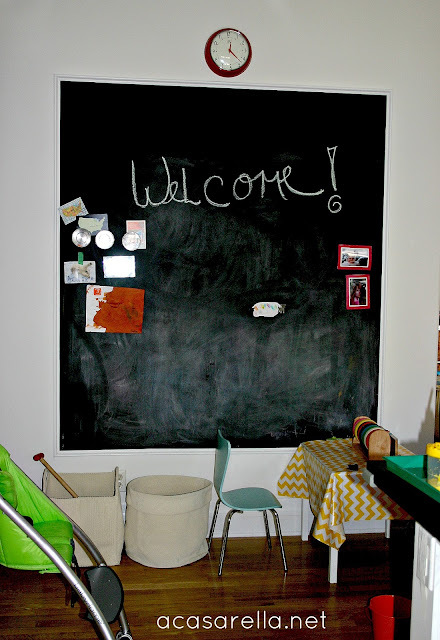 This is a great way to get some without glueing it to the wall! It actually *is* glued to the wall. The frame is just built around it. Shame on you, for it's so worthwhile. Beautiful home. The balloons are darling. Wonderful ideas here. Love your blog name. I am happily your newest follower. Oh my gosh I love love love it!!!! I am very jealous that I don't have that artistic gene. I think you do a fabulous job though too E! I love your home decor! 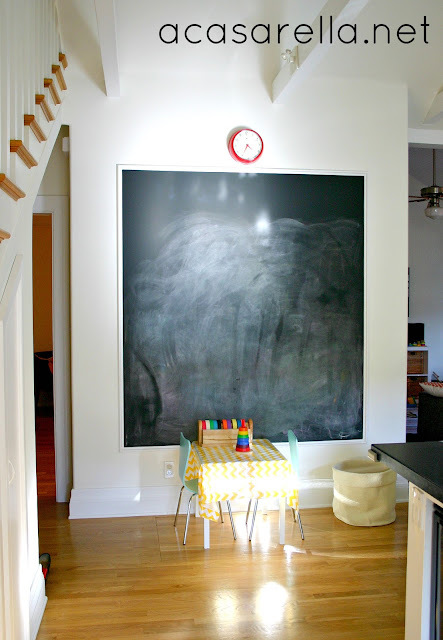 Gorgeous idea, love the wall paints of your sister in law dining room. When we used it in home, yellow becomes a welcoming, happy hue that brightens our spirits. Oh those shelves are great! And... I love that mobile! Love that hot air balloon mobile! I've already decided that if I ever have a boy his room is going to be centered around a huge wall map that I have, so an Around the World in 80 Days theme would be PERFECT. 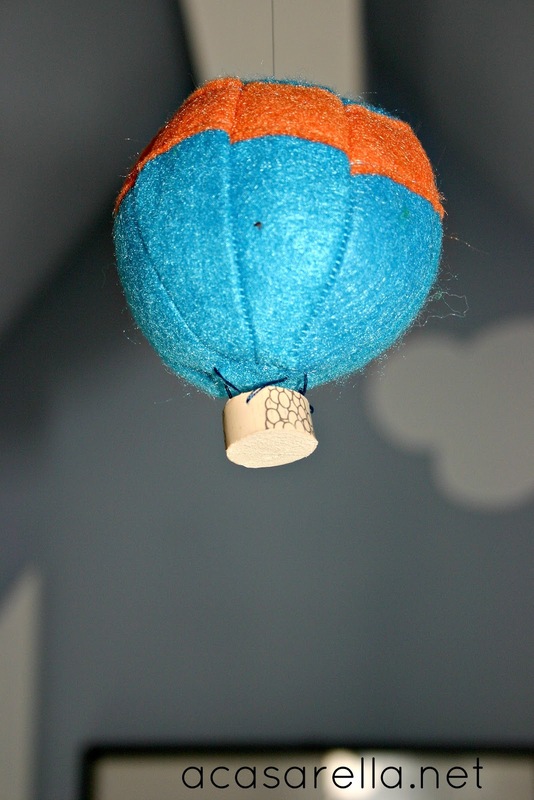 OMG, now I have to have a hot air balloon mobile. Genius! The mobile is so adorable! Thanks for coming to party with us! What great ideas in this house! I love that pop of green in the bathroom, and well I guess I love it all. Thanks for sharing these fun ideas! I entered the Pinterest Challenge too (my first time, I'm so excited)! 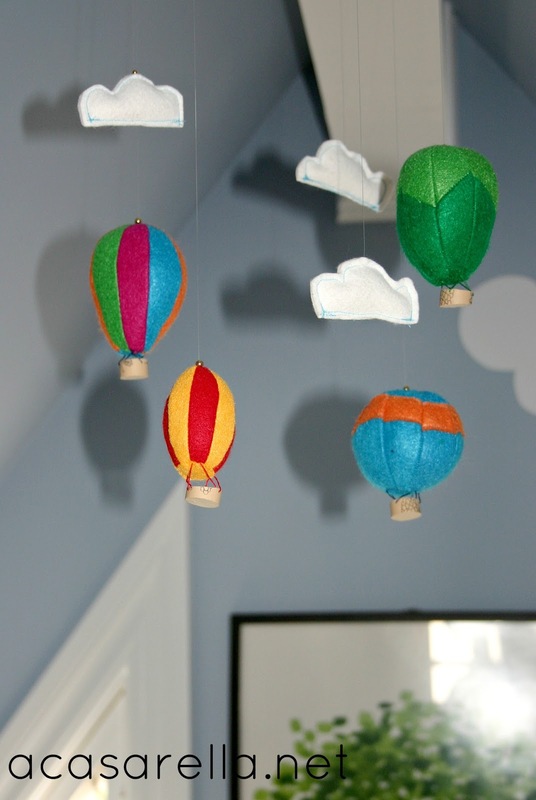 She made that balloon mobile!?! That's insane, and awesome, and impossible, and totally covet-worthy.